At the Coast Guard Academy, there is a tradition of ordering the ‘little ring’ to be given to the woman in the cadet’s life, whether it is their mother, grandmother, or girlfriend. 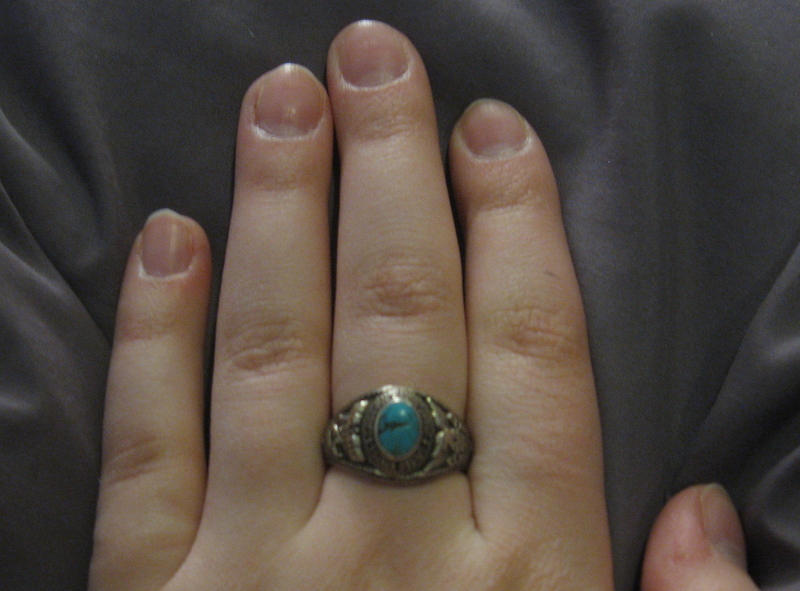 The little ring is a smaller version of the class ring that cadets can order in their 3rd class year. On one side of a center stone is an eagle with the Coast Guard crest and on the other side is the cadet’s class crest. My brother gave his little ring to our mother, choosing her favorite stone, turquoise. As I have gotten older, I have realized how much of an impact my brother has had in my life. When I was a child, he was just the older brother that I bugged, tagging along after, getting in his way. I didn’t realize then how much he impacted my thought and decision-making process. My brother once told me, “To be early is on time, to be on time is late, and to be late is to be in deep trouble.” I have never forgotten it and I am early to things as often as I can be. There are times when I am unsure and confused and I talk to my brother, asking his opinion and advice. My brother, now a Coast Guard Academy graduate is stationed in Alaska with his wife, who is also an Academy graduate. For the past year, I have been dating someone, who happens to be a Coast Guard Academy graduate as well. It is very important to me that my boyfriend and my brother meet. I am an independent woman, working my way through the beginning of my life, but there are days that I really miss my brother. I can honestly say that if it were not for him, I wouldn’t be who I am today. Because of all that, I said yes without any hesitation when my mother offered to let me wear the little ring. Now, I always have something with me to remind me of my brother. Carol Dooley, my guest columnist is a college student born and raised in the Midwest. She is currently working on a history major with a minor in museum studies. She gives a nod to her Dad for that interest, as he has always been a military history enthusiast. Family means everything to Carol and she is a stronger person because of the mutual support that exists in her family. Thank you Carol for sharing your wonderful story. Many blessings to you , your boyfriend, and your family as you continue on your journey in life. This entry was posted in My Thoughts and tagged Alaska, Carol Dooley, Coast Guard Academy, family, history, little ring, military life by Janie Reinart. Bookmark the permalink.